– Lippen Schweigen from Franz Léhar’s Die Lustige Witwe, Libretto by Viktor Léon and Leo Stein, Based on Henri Meilhac’s L’attaché d’ambassade, First Performance on December 30, 1905 in Vienna, Austria. 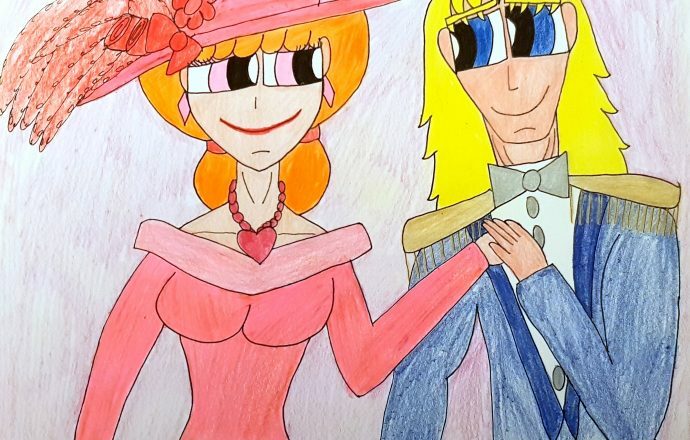 This piece of Blossoomer fan art, which is part of BrickercupMasterX3’s annual Blossoomer month, is dedicated to Annie Pham aka Zero-Kiba and craycrayevie who celebrated their birthdays three days ago, Eva aka Shanks-kun who celebrated her birthday two days ago, dopperugengaa whose birthday was celebrated yesterday, and PockyBloo whose birthday is being celebrated today. So, I hope you guys have such magnificent, grand, and awesome celebrations and I wish you so much love, joy, happiness, positive vibes, and greatness in your lives as artists and as people. I would also love to dedicate this to all of the Blossoomer fans and shippers out there. So, sit back, relax, and soak in the Blossoomer goodness. 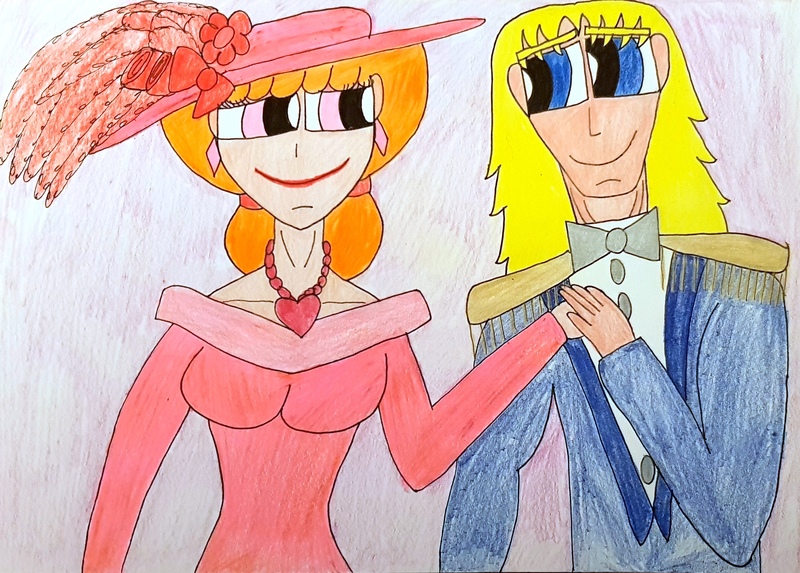 Here we have 25-year-old Blossom as the merry widow herself, Hanna Glawari, and her darling 26-year-old life partner Boomer as Count Danilo Danilowitsch from one of Franz Léhar’s most well-known operettas of all time, “Die Lustige Witwe” known in English as, of course, “The Merry Widow”, which, in turn, is one of my most favorite German operettas ever. Blossom certainly embodies Hanna’s brand of grace, nobility, beauty, and stature to a T, while Boomer embodies Danilo’s genteel, noble, and gentlemanly grace so effectively that their overall chemistry is glorious. Moreover, I do not have to explain to you any further why I love Blossoomer so much. Sufficed to say, Blossoomer is gorgeousness and loveliness incarnate. Lippen Schweigen from Léhar’s “Die Lustige Witwe” is a duet I grew up with ever since I was a sixteen-year-old boy in my second year of high school, even though I practiced this song as a solo number. I love the sweeping melody, the graceful tones, and the blending of voices for any tenor or baritone who sings Danilo and any soprano who sings Hanna. Hence, for your listening pleasure, I present to you my three favorite renditions of this lovely duet sung by these following pairs: Rudolf Schock and Melitta Muszely, Agostino Lazzari and Virginia Zeani (in Italian), Nicolai Gedda and Anneliese Rothenberger, Francisco Araiza and Regina Klepper, and Jonas Kaufmann and Diana Damrau. I hope you enjoy these selections, as you gaze into this fine piece of Blossoomer fan art. I hope you all enjoyed these selections, which I felt accompanied this piece of Boomer x Blossom fan art. Let me know in the comments below which one you prefer and I will see you all in the next submission. Blossom and Boomer from The Powerpuff Girls belong to Craig McCracken and Cartoon Network.